We hug the hearse as it inches along Ponce’s back streets. Caped mourners veiled in black lace swing lanterns, wail and sob into their hankies, and fan themselves in the warm night air. The deceased, a pearlescent, person-sized, pink-lipped fish, rests in an open sequin-covered coffin. Her fate is decided tonight, for tomorrow is Ash Wednesday. 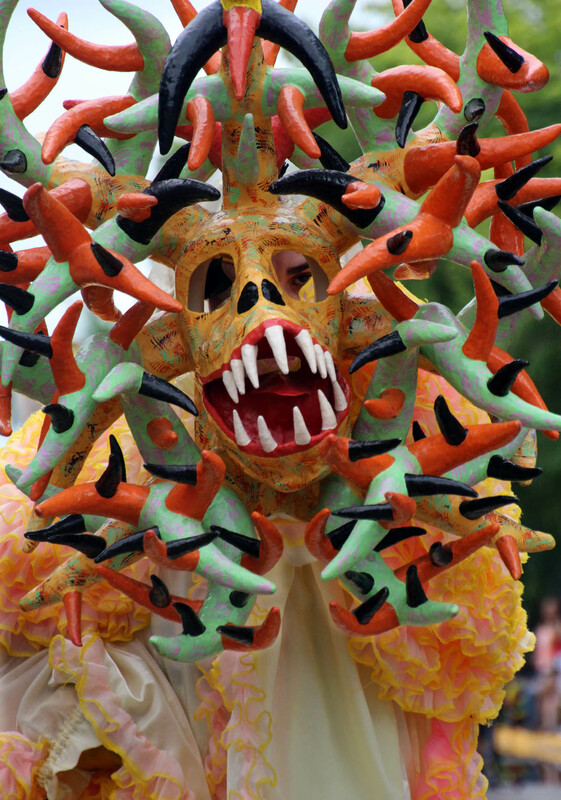 We bring up a procession of school bands, beauty queens, acrobats, cabezudos (big-headed guys), stilt walkers, and the face of Carnival, vejigantes; horned devils named for the vejiga, inflated animal bladders sported as weapons. As we approach the crowded main square, Plaza las Delicias, each group passes the raised throne of El Rey Momo, the Carnival King, to showcase its talents. In the Sixteenth Century, the Spanish empire overtook much of the New World, bringing its culture and Catholicism. Carnival, traceable to the Romans, integrates a pagan purging of winter, a surge in indulgent behaviors and play at social upheaval before the privation of Lent. In South America and the Caribeen, winter’s absense has deemed some rites moot; yet they persist, and evolve. 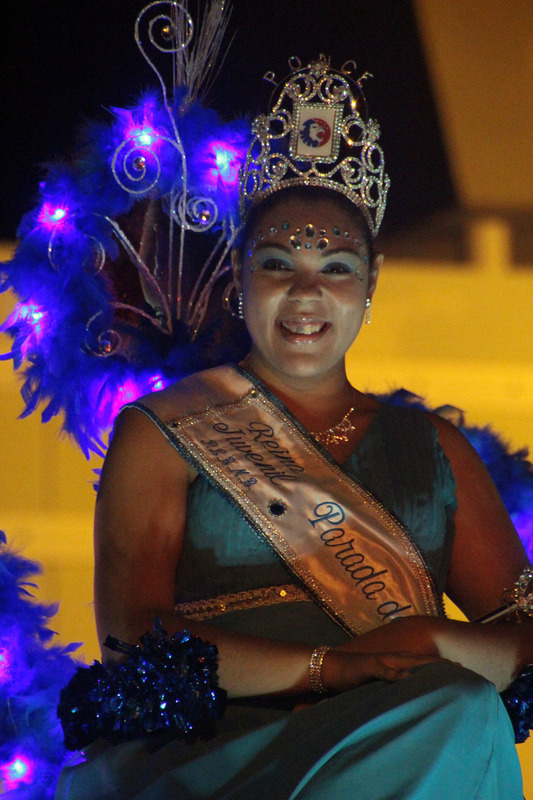 Ponce’s week-long Carnival traces to 1858, the same year Samuel Morse set up the first telegraph on the island. As I arrive, the crowning of queens, both pre- and post- pubescent, and vejigante showcase, have already transpired. 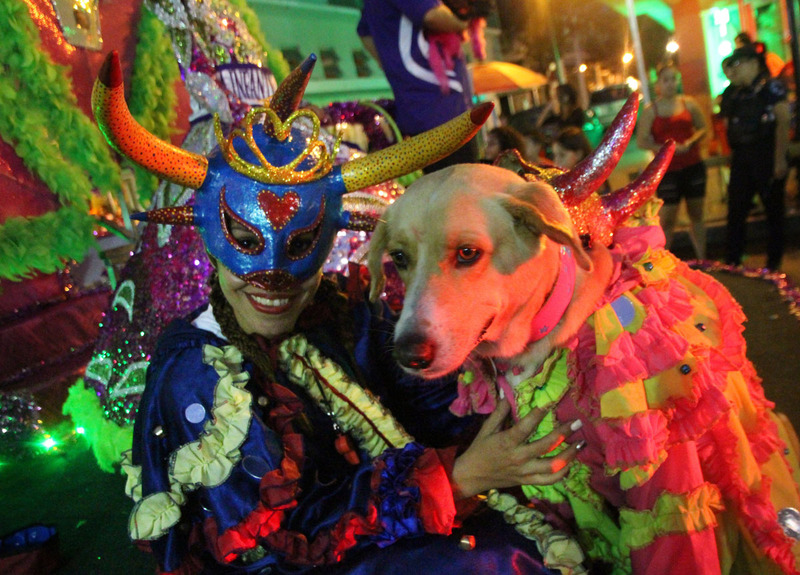 But there are art shows, salsa, bomba, and plena on the streets and stage, the big Saturday parade and final ceremonies, plus an abundance of fried food. From my room near the square I transect the city on foot. At the organic market, I indulge in a carambola soda. Hummingbirds dart among yellow flowering tabebuia trees, and blocks of bright Creole houses are checkered with abandoned structures needing TLC. Yet some of Ponce’s most significant historic houses serve as restaurants and cultural institutions. The high-ceilinged, breezy rooms of the History Museum are dense with photos and timelines of Ponce’s evolution as a cultural and political hub. At a workshop at the Institute of Puerto Rican Culture, artisan Freddie Soto shows how to make your own vejigante mask. He uses cow horns as molds, wrapping them tightly with strips of goopy, specially-treated paper. Bright paint is applied in layers. 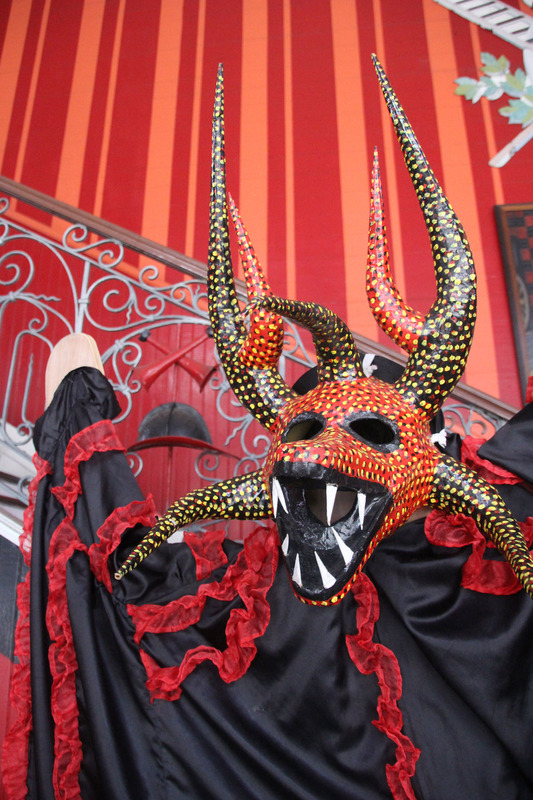 The horns can be twisted in many angles; every mask is individualized. For a different view of Saturday’s Main Parade, I hike outside the city’s historic core to meet it halfway. Along the route, spectators claim patches of sidewalk with camp chairs and coolers. The unsettled sky gives way to a tropical downpour that briefly sends us under the protective canopy of strangler figs. For over six hours, we are treated to a spectacle both homegrown and familiar; politicians in vintage cars, giant pirates, bands from all about the island, rescue dogs in satin. 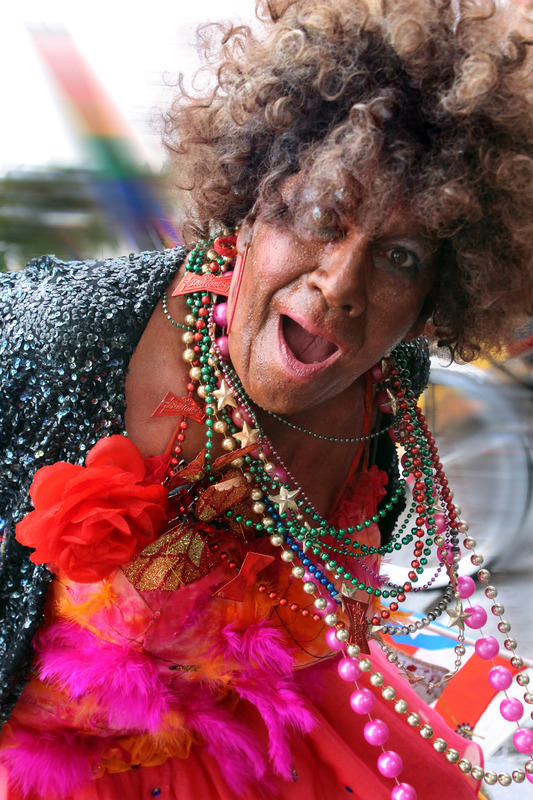 From Loisa Aldea on the north coast, a wildly festooned truck of cross-dressers in black face. And quasi-vejigantes; disguised in rubber Halloween masks instead of traditional ones. Those that can squeeze into the Plaza enjoy salsa dancing into the night. Families mingle and nosh, vejigantes, their animal bladder weapons now more often distended plastic bottles, play at being marauders. Despite the din, just steps away from the stage in patches of lush vegetation, I hear the persistent peep of the coqui, the island’s native frog and mascot. And what will become of La Sardina ? 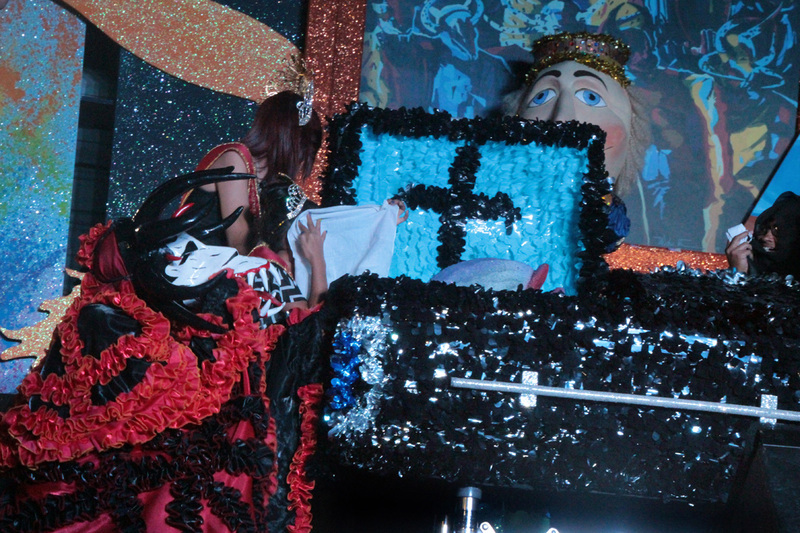 On this final night, her casket has been lifted to rest at center stage, before El Rey and the Citizenry of Ponce. Will she soon be interred in the local cemetery, or torched before our eyes, as she would be in Madrid? Firemen stand in the shadows, their hoses poised. Ya se muerto el carnaval! Que se vuelve a levantar. But during the mourners’ traditional Carnaval recitation, a straw, denim-clad dummy is brought forth, hoisted onto a scaffold between the crowd and stage. 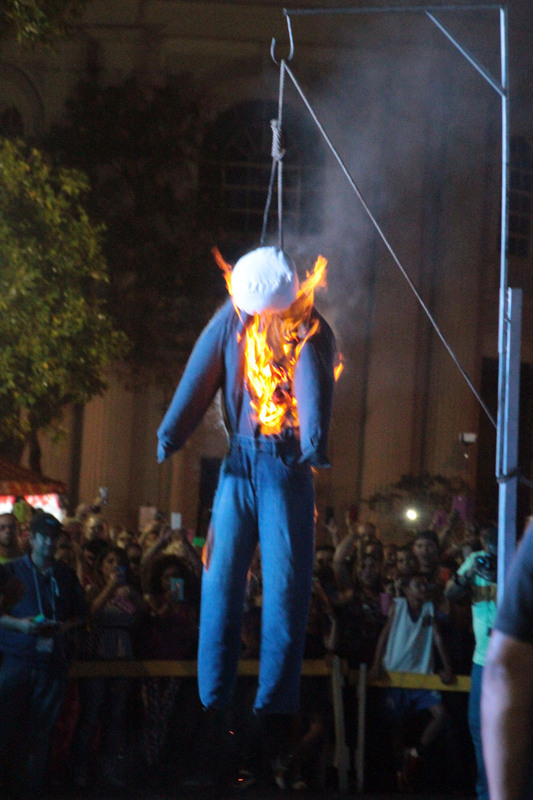 After a safety zone is established, the effigy is set ablaze. Sparks flying, it breaks apart and falls to the pavement, to be extinguished by quick-moving bomberos. Depending on which belief system you follow, its Judas, or Pelele, whose fiery demise assures that good (or spring) will follow. And I’m relieved that La Sardina, who must have taken weeks to design and fabricate, will be returned to air-conditioned storage, to be borne aloft again. So he can rise again.